I just wanted to provide an update on a special project that’s been an exciting journey for me. 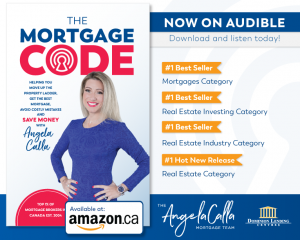 Last fall, my first book The Mortgage Code became a best seller on Amazon in four categories, both in Canada and the U.S.
An audible version of The Mortgage Code is available today. It’s an easy way to get all the information you need from my bestselling book. As a mortgage professional for 15 years, I’ve helped bring clarity to Canadians seeking a mortgage, and The Mortgage Code will do the same. In a fluctuating and uncertain market, it’s the perfect time for a book like this to help homebuyers understand the mortgage process, save money and make the right mortgage decisions. While being a consumer advocate has been a passion of mine since the beginning, so has giving back to the community in which I live. That’s what makes The Mortgage Code such an exciting project. All proceeds from the sale of the book this year will go to the Eagle Ridge Hospital Foundation. The EHRF does amazing work raising funds for much needed equipment for Eagle Ridge Hospital in Port Moody. I’m proud to partner with such an amazing organization. If you’d like to chat more about The Mortgage Code please feel free to contact me anytime. In Canada, click The Mortgage Code to download today! In the U.S., click The Mortgage Code to download today! However, The Globe and Mail’s Bill Curry reported on Wednesday that Ottawa appears to be considering a move that would allow first-time home buyers to obtain 30-year insured mortgages, up from the current 25-year limit. The Canadian Home Builders’ Association has discussed policy changes in recent meetings with officials in the Prime Minister’s Office and Mr. Morneau’s office. Angela Calla is a 15 year award-winning woman of influence mortgage expert. Alongside her team, passionately assisting mortgage holders get the best mortgage, and educating them on The Mortgage Show on CKNW for over a decade and through her best-selling book The Mortgage Code available on Amazon. To purchase the book click here: The Mortgage Code. Proceeds from a sales will help build a new emergency room at Eagle Ridge Hospital. 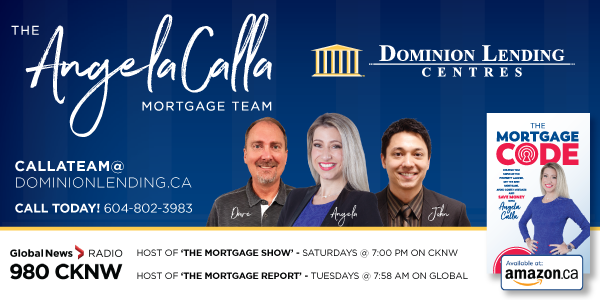 Angela can be reached at callateam@dominionlending.ca or 604-802-3983. When you’re preparing your taxes, you’ll want to have your mortgage statement ready. Here is what you need to know. 1. Lenders send statements out by Feb. 28 at the latest – if you haven’t received it by the first week of March, contact your mortgage provider (asking for it earlier may result in an admin fee added to the mortgage as lenders are busy with preparing their year end statements). Also signing up online may also provide details required. Property taxes/ life and disability insurance – payment amount and balance on available pre-payments – while the insurance policies are bundled, often there can be errors and not end up the responsibility of the provider. 3. Bring this statement when you do your taxes – there may be available write-offs or grants available to you. If you use part of your home as an office or if any of your borrowing was for investment or renovations for seniors, energy efficiency, etc. 4. Keep your mortgage statement, year-end pay stub and T4 together in an e-file once you get your tax documents back, with the T1 General (full) and Notice of assessment. If you require any borrowing, or there is a better mortgage strategy available in the upcoming year, it’s standard practice to be asked for all of those documents. 5. A very popular strategy is borrowing for RRSP top up – before you do this, check if you qualify under the new stress test for the mortgage you have or if you are hoping to move up the property ladder. The biggest mistake mortgage holders make is not taking into account that every $500 in debt – even for investment takes away up to $100,000 in mortgage amount qualification. So, a little planning can ensure you reach your goals for the upcoming year and optimize your options.